The Galaxy Grand kernel does not support OTG from what I can see. There may be a custom Kernel to support it if you are willing to root etc, the only one I found was for 4.1.2 and abandoned due to huge number of bugs. Rooting will void your manufacturer/carrier warranty and is not for the wary or anyone who can't risk losing all data from their device. Try XDA developers for your device and see what custom kernels are available. As it stands you don't have that option (unless something in the firmware has changed in the last few months). 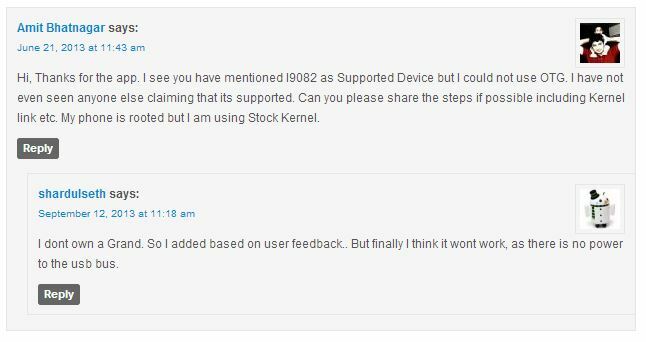 This XDA thread seems to confirm there isn't a kernel you can use for this I'm afraid. This XDA thread has an experimental kerlel, which may help, but as previously stated there are warranty, and functionality issues with any custom kernel. IF you decide to root your device, this link has a how-to guide which you use at your own risk! Read, and read some more before you decide. Back up everything and follow the steps to the letter. Ensure that you have the EXACT same device as in the thread also. DISCLAIMER: ROOTING YOUR PHONE WILL PROBABLY VOID YOUR WARRANTY FROM BOTH THE CARRIER AND THE MANUFACTURER. IF YOU DO NOT WISH TO ACCEPT FAULT FOR ANY ADVERSE EFFECTS OF ROOTING, THEN DO NOT RISK IT. HERE BE DRAGONS. Is your device rooted? If not try rooting and installing USB OTG Helper or Stickmount. These apps work only on rooted devices and help to mount USB devices. The best way to know is to try is to root and try these apps yourself. By rooting you can change kernels that could help these apps to mount USB drives. There is a XDA webpage, which seems to show some light at the end of the tunnel. However, patching kernels are not for faint hearted and I would not advice to take that path, if you are hesitating even to root. Samsung Galaxy Grand (GT-I9082) Duos 4.2.2 Jelly Bean does not support OTG. I checked. You could check with USB Host Diagnostics - though, you'd need to get a USB OTG adaptor and actually plug something in to check. I'd also add, while many devices may support USB OTG, they may not support plugging in mass storage devices - I have a tablet that I can use a keyboard with, but not USB drives. I do seem to find a lot of references to it not working, like RossC's link, but nothing that says it does. Not the answer you're looking for? Browse other questions tagged 4.2-jelly-bean usb usb-on-the-go samsung-galaxy-grand or ask your own question.